As your pregnancy progresses, the body shifts and changes in so many ways that it’s definitely a journey worth documenting. If you are just starting out your nine-month journey and are looking for some creative way to document and remember the process, consider one of the following for a keepsake you can continuously look back on over the years. YouTube is a very popular way to document anything in life and a pregnancy is definitely something that video clips can document in a fun and personalized way. When you first think of YouTube, you may think of the many people who use it to give tutorials and teach information. There are also plenty of people who create vlogs (video logs) and share their lives. In this case, you could sit down at the computer on a monthly basis and share how each month is going and how you’re feeling. You can also take little video clips while you are out and about getting ready for your baby, shopping for baby clothes, painting the nursery or trying to find some comfy maternity outfits. In addition, don’t be shy about sharing tips for other expectant moms as this could be a great resource for others going through the same journey or for others down the road. Time lapse pictures are always fun because people love instant gratification. While you may have to carry the baby for 40 weeks, most people would prefer to see the abbreviated version. Take pictures in the same shirt, hairstyle and pose each week throughout your pregnancy. Once the birth happens, you’ll be able to have 40 documented weeks and can put it together in a quick time lapse to share with others and enjoy. There are a few charts that explain the size of your baby as it relates to food. In the first few weeks, the baby goes from the size of a poppy seed to a pomegranate seed. Eventually, the baby will grow to the size of a watermelon. One great documentation, especially for all the foodies, is to take a picture each pregnancy week next to, holding, or eating the food which represents your baby’s size. Just like the time lapse, before and after pictures are very popular. The process in-between isn’t always as crucial for many to see. If you’re not really crazy about taking pictures of your growing belly, you might prefer the before and after option. You’ll only need to take one picture when you’re at the full-term stage of your pregnancy. Once you give birth, take a picture in the same attire as your previous, full-term picture. The only difference now is that you’ll have a baby in your arms. During a pregnancy, a woman’s body expands in ways she could never imagine. Once she’s given birth, the body typically goes back to its regular shape with proper diet and exercise. If you’d like to remember what it was like to walk around with such a large belly, one option is to do a plaster cast. They’re easy to purchase through online shops or in maternity stores. You can even ask a trusted friend or significant other to help you with the plastering process or have your significant other involved in the cast itself. If you’re a woman who prefers to write down her thoughts and feelings, a blog is a perfect way to document the journey. It’ll be nice when you’re a few months post-partum to look back and read about your experiences, what you were working on at the time and what you were thinking about during the first few months of your journey. If you decide to go the blog route, you can even use it as a means to share your journey with others. All arts and crafts lovers should definitely try this option. Local craft stores are usually overflowing with scrapbook paper, stickers and accessories for the expectant woman. Take pictures of the major moments like the baby shower and maternity photo shoots to make this a nine-month album to remember. As you progress throughout the 40 weeks, your nose might spread and your voice could drop. These are funny changes that affect the way you sound. If you’re not likely to sit down and write a blog about it all, consider recording your voice. Most phones have a voice memo option. Pull out your phone and record your thoughts. This could be a therapeutic release for you as well. 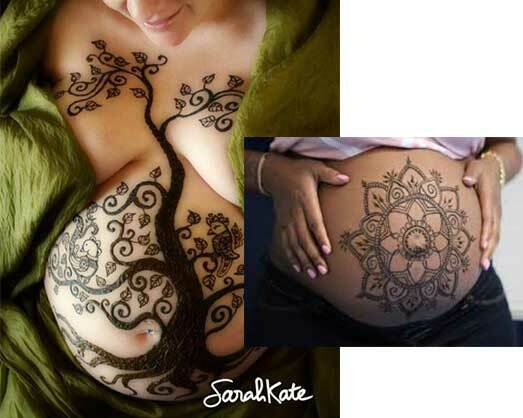 Henna tattoos are typically located on the hands and arms, however, for a different look, place the henna tattoo on your belly. Wait until you’re further into your pregnancy. It’ll make a bigger statement that way. Be sure to take lots of pictures of the finished product because, like your baby bump, it’s only temporary. You may not feel very photogenic but trust us, your pregnancy is something you are going to want to have photos of. Whether you choose to have a friend take some photos for you, or you book a professional, remember to get a maternity photo shoot. This is a time you’ll never want to forget, plus, your child will be able to look back and see what mommy looked like when she was pregnant. While there are countless ways to document your nine-month journey. These 10 ways can help give you a starting point for choosing an option that works best for you. Regardless of the avenue you decide to take, be sure to do something to document your pregnancy for you, your spouse and your child to look back on in the future.